Is Samsung Laughing at LG Today as Their Korean Rivals Unveil a New High-End Passive 3DTV? I wonder whether Samsung execs are calling LG "stupid shits" in their Korean HQ today, after LG announced its new flagship TV, the LW980S. 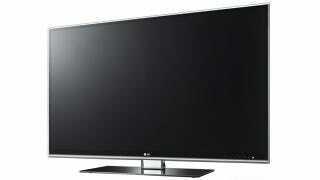 It is, naturally, a passive 3DTV that they claim handles 1080p. After a trial of active shutter TVs, LG's obviously persisting with passive 3DTV over the more superior 3D format which is what Samsung and the other manufacturers have rightly adopted, a move which caused Samsung to brand LG "stupid shits" when referring to their 3DTVs in April. If passive 3DTV is your game though, this LG TV will be the one to go for—the full LED screen upconverts 2D images to 3D, while also offering 3D video on-demand through the LG Apps store. Full specs haven't been revealed by LG just yet, though we do know it will use a TruMotion 400Hz filter to eradicate judder and has inbuilt Wi-Fi and DLNA 1.5 support, but there's some corporate boasting going on down below if you're really that into passive screens. On sale in October, it will be available in 47-inch and 55-inch sizes, and come with a Wiimote-style controller plus a free app for iOS, Android and Windows Phone 7. SEOUL, Aug. 2, 2011 – Today in Seoul, Korea, LG Electronics (LG) took the wraps off its newest development in home entertainment, the LW980S. The LW980S is a top-of-the-class TV that combines LG's advanced CINEMA 3D technology, Smart TV functions and NANO FULL LED all in one sleek package. "The LW980S is the crown jewel of TVs as it includes the most advanced technologies and features we've developed at LG over the years," said Havis Kwon, President and CEO of LG Electronics Home Entertainment Company. "We've set a new benchmark in connectivity, picture quality and sheer viewing enjoyment." Addressing one of the big sticking points of conventional 3D TVs, the LW980S comes with comfortable, lightweight glasses that don't need to be recharged and are easily replaceable. The LW980S tackles the thorny issue of not enough content with a proprietary 2D to 3D conversion technology that guarantees a ready supply of shows and movies in high quality 3D. CINEMA 3D, the world's first 3D display technology to receive "Flicker-Free" certification from TÜV and Intertek, two of Europe's most reputable testing agencies, means that viewers no longer have to worry about the dizziness or disorientation they might experience watching other 3D TVs. Also, Wide Viewing Angle ensures they can watch the TV from practically any position in front of the TV, whether sitting, leaning back or lying down. Together with the affordable glasses, this makes the LW980S perfect for watching in larger groups. And with 3D Video-on-Demand – available through LG Apps – viewers will never be short of exciting, top-quality content to watch at home. Using the Magic Motion Remote Control, LW980S users get access to all the Premium Content they could want with just a couple of clicks on the mouse-like control. Moreover, Smart Share makes it a cinch to share content between the user's TV, mobile phone and other digital devices. The LW980S's viewing experience is further enhanced by LG's unique NANO FULL LED lighting technology. Via an extremely thin film printed with minuscule dots, NANO FULL LED disperses light more evenly across the screen, to create brighter, clearer and smoother pictures. TruMotion 400Hz ensures those pictures stay silky smooth, no matter how fast the action.